I don’t know about you, but there are days when I am running late and need to fix something quick and easy in the morning for my family. Everybody loves muffins, so I try to keep several different kinds of mixes on hand when we want something homemade in the morning, but don’t have much time. There are many different brands out there. You can pick the ones you like the best and keep a few in stock in your cupboard. We like chocolate chip, and apple the best. There are also poppy seed, blueberry, strawberry and many more. Many times I will add my own extra ingredients to give them a touch of my own. 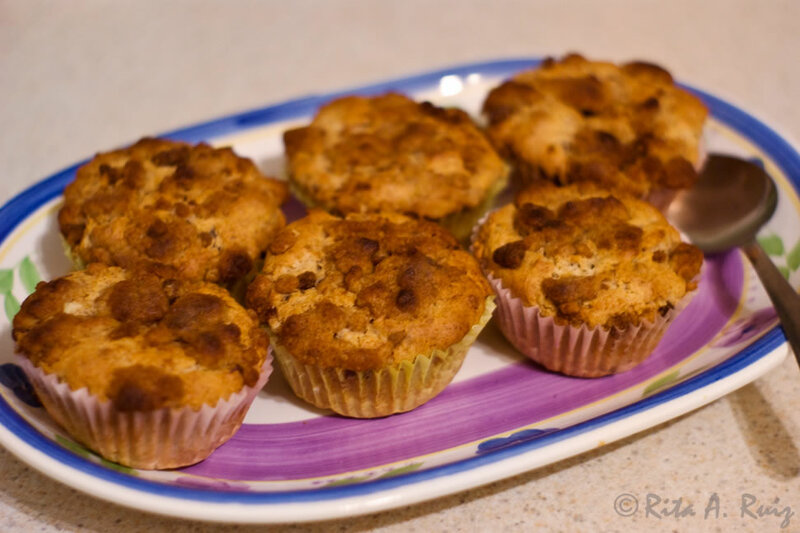 These apple muffins have an extra crumb topping that is so simple to make and so delicious! 1 pkg. 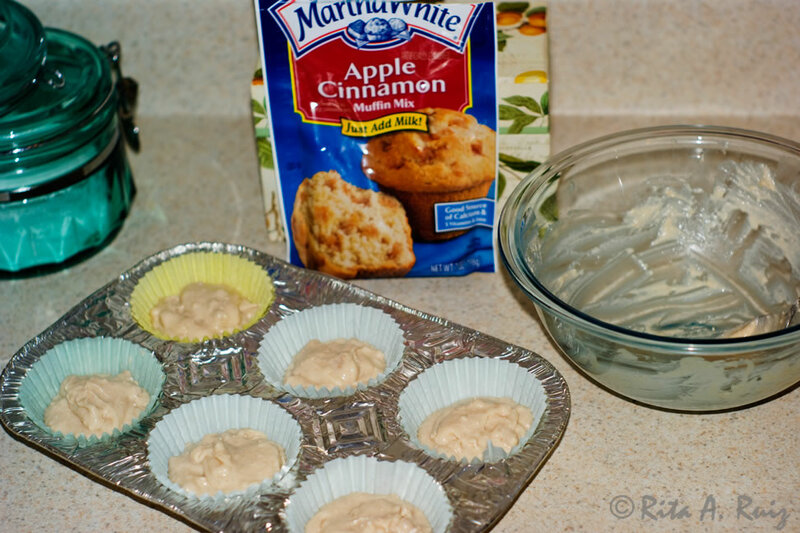 store-bought Apple-Cinnamon muffin mix–any brand that is your favorite. First, prepare the Apple-Cinnamon muffin mix as directed on the package. I buy the kind that all I have to do is add milk. How simple can it be?! 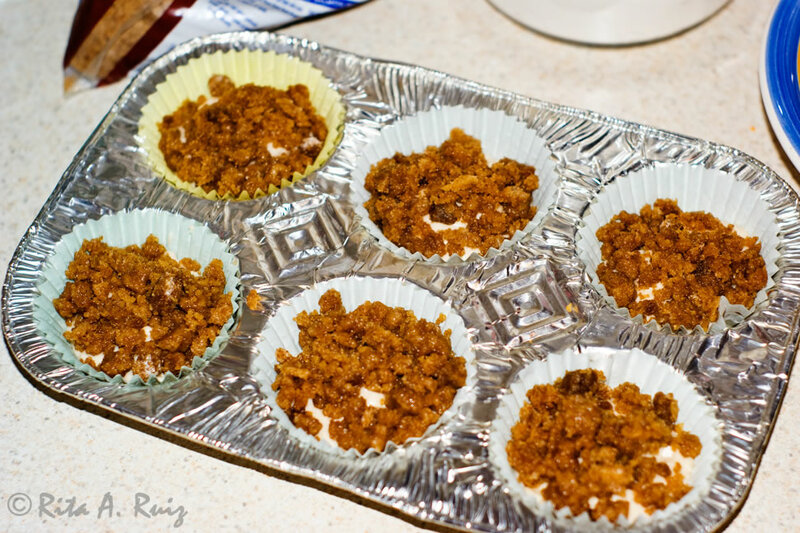 Spoon the mix into individual paper muffin/cupcake holders. Turn the oven on according to the package directions to preheat. Set the uncooked muffins aside. Then I take the 2 tbsp of butter, put it in a microwavable bowl, and zap it for about 45 seconds or so. 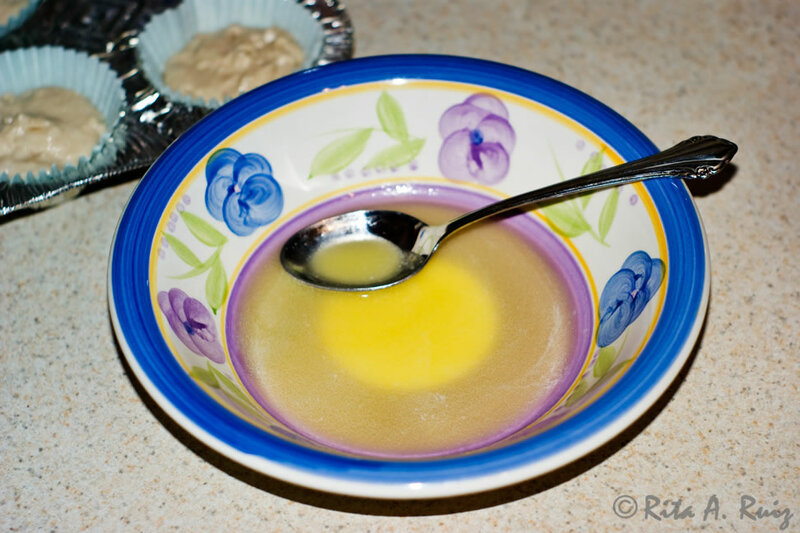 If the butter is not melted down all the way, just stir it with a spoon until it all melts. 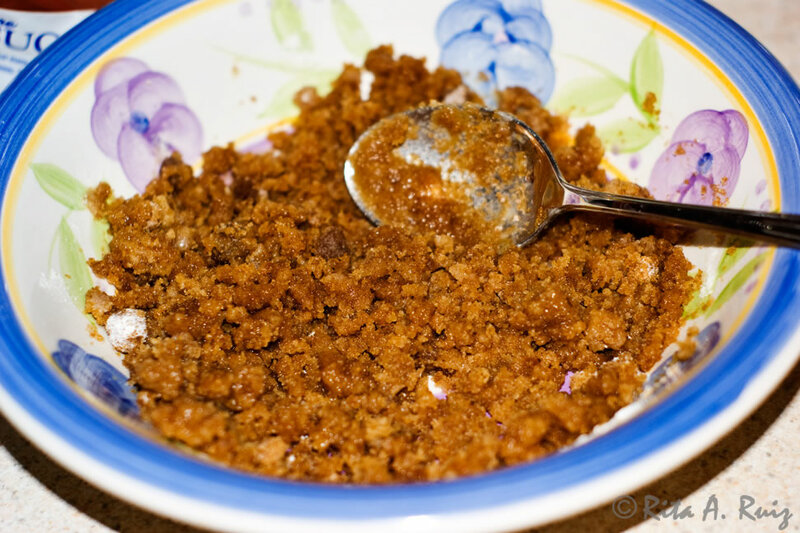 Now you’re going to add the flour and brown sugar to make your crumb mixture. And, anytime I put a recipe on here that I have made up or partially made up myself, you will probably here me say this over and over, I don’t really measure my ingredients. Basically, only if I am doing a new recipe from someone else or from a cookbook for the first time will I follow the instructions as far as exact measurements go. So for this part, I probably used the same amount of flour and brown sugar as I did the butter. 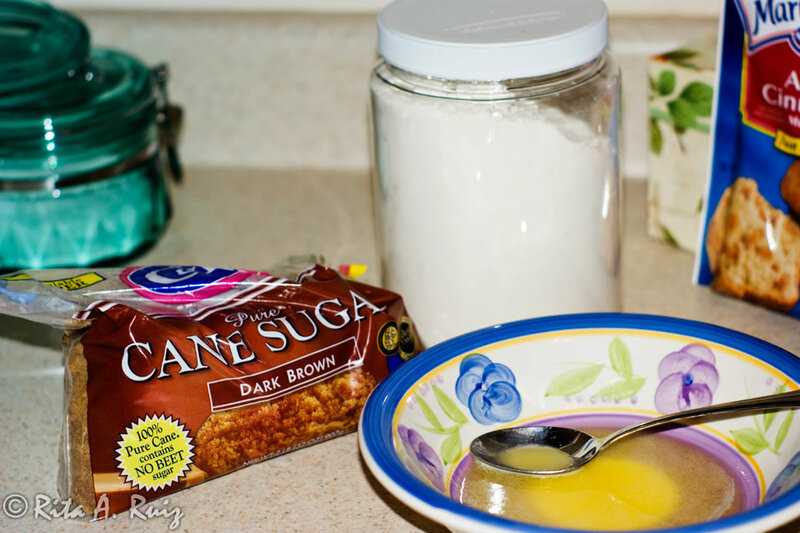 Approximately, 2 tablespoons of each. 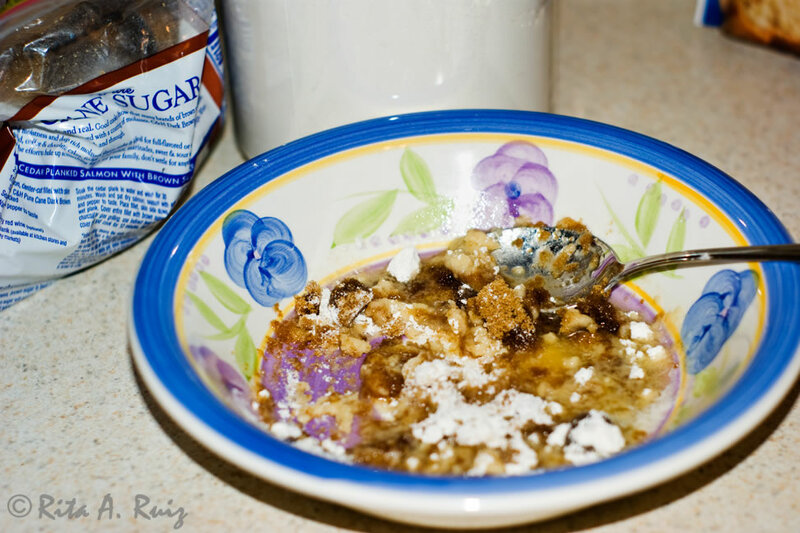 Although, I did have to add a little more of the flour and maybe a tad bit more of brown sugar to soak up the butter. Now, gently stir the ingredients in together. You don’t want to mix them thoroughly, just enough so it forms little balls or lumps of the ingredients. Like this. You’re almost there. Take the already spooned uncooked muffin batter and add about two spoonfuls of the crumb mixture on top of the batter. 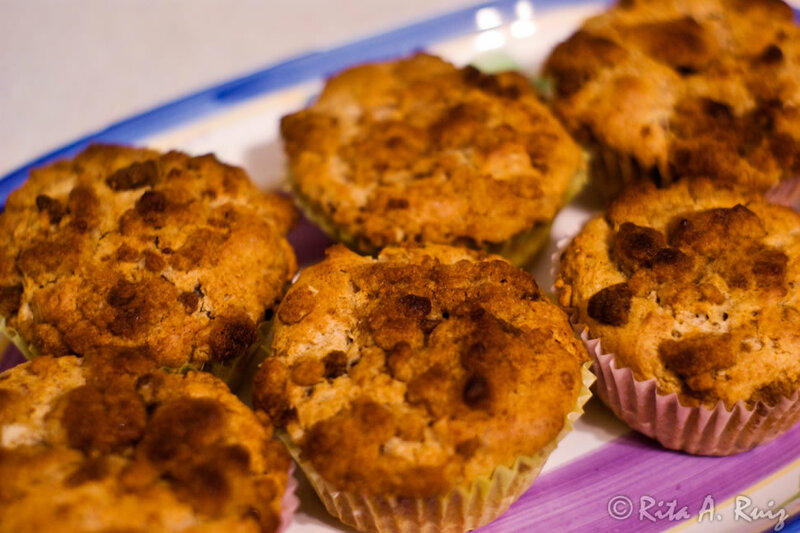 You should have just enough crumb mixture for six muffins. Place your muffins inside the oven and follow directions on package for time needed to cook. Keep an eye on them toward the end so the crumb mixture doesn’t overcook. Remove and place on wire rack or plate for cooling. Serve warm with a glass of cold milk.